John and Betty Taylor More were one of the first European settlers in the Catskill Mountains of Delaware County, New York, in 1772. John and Betty befriended the famous Mohawk Chief, Joseph Brant, who warned them of an impending raid on settlers during the Revolutionary War. John, Betty, and their family were saved when they fled their cabin home in the middle of the night. 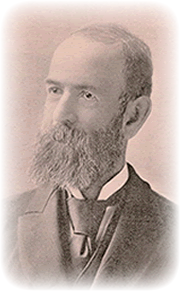 Cousin Jay Gould (genealogical #326-Alexander Line) is America's 9th wealthiest man of all time! (photo below) One of the railroad baron's of the 19th century, Gould owned the Union Pacific Railroad and the Western Union Telegraph Company. He died in 1892 leaving a fortune of $70 million and a gothic revival mansion on the Hudson River, Lyndhurst Castle, now part of the National Trust for Historic Preservation. JMA has been featured nationally on the NBC Nightly News with Tom Brokaw, PBS, and in The New York Times. More family archives are preserved in the New York State Historical Association's Research Library in Cooperstown, NY. The mid-19th century house of Jonas More (fourth child of John and Betty) is restored and displayed on the grounds of the Cooperstown Farmer's Museum. JMA has 9 family landmarks in New York State-mostly in the Catskills- including the burial place of John and Betty and the site of John More's original cabin - affectionately known as the "pile of rocks." JMA has a record of 15,000 descendants. Cousin James Hadley Billington (genealogical #824412) is the U. S. Librarian of Congress in Washington, DC. He was sworn in as the Librarian of Congress on September 14, 1987. Dr. Billington is the 13th person to hold the position since the Library was established in 1800.